There has been a debate going on for a while now between my husband and I about whether or not the 'green' cleaning products work as well as conventional cleaning products. When it comes to bathroom cleaning, he believes that bleach is required. I, on the other hand, would do anything to avoid that harsh chemical smell and the headache that follows. So what is wrong with using conventional cleaning products anyway (other than my headache)? Conventional cleaning products contain bleach, ammonia and other chemical agents that leave your home looking clean, but pollute both our water supply and our bodies. 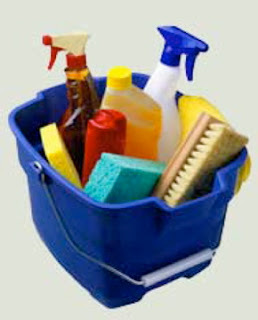 Many ingredients found in household cleaners can cause eye irritation, skin irritation, lung irritation and have been implicated as possible contributers to asthma and cancer. Children are especially vulnerable to the effects of these chemicals simply due to the fact that they are smaller and still growing. One article I read pointed out that although the use of one cleaner may not be extremely harmful alone, we tend to have a cleaner for every different area or purpose, all interacting, all seeping into our environment and causing damage. Commercial green cleaners are readily available now and offer a safer way to get your house clean. There are many benefits of using 'green', 'natural' or 'organic' cleaning products. Here is a general list of what to look for in a green cleaner. You will need to read labels and product information based on the specific brand you are considering. Free of petrochemicals, chlorine bleach, phosphates, nitrates, borates, kerosene, phenol, lye, hydrochloric acid, sulfuric acid, ammonia, formaldehyde, etc. We have all heard the negatives associated with green cleaners: they don't work as well and are more expensive. It's true that you may need to use a little more elbow grease with the green products, but the surfaces will be just as clean. And as far as the cost is concerned, I bought some Clorox Green Works the other day and thought the price was comparable to the conventional all-purpose cleaners on the shelf. This does not mean that in general pricing isn't higher for green products, it is, but as with anything else if you shop around, you may find a good deal. (Check manufacturer sites below for coupons and Mambo Sprout has a coupon for Method products.) Also take into consideration that some of the companies, like Shaklee, offer a concentrate that you mix yourself, cutting down on tons of packaging and waste. I can't necessarily provide you with my own personal experience or evaluation of all the green cleaning products available today so I asked some of my green Twitter friends to name a few of their favorites. Here is a list of companies/brands that you may want to check out in no particular order. In addition to all of the ready-made products like the ones I just discussed, there are lots of natural cleaning products you can make at home. We will surely talk more about those in a future post. Awesome post! This is an area I'm just starting to really delve into and these references will be great! I really have to start using less toxic products. Evita over at Evolving Wellness has done some product reviews on cleaning products, so you may want to check her site out! Green cleaning products are catching on quickly. More and more building owners have increased awareness of the harmful effects of traditional cleaning chemicals to health and environment. Aside from being cost-effective, green cleaning products are increasingly being recognized as a smart strategy for facilities focusing on environmental endeavors.